The UMass defensive line will be very different in 2010 as we lose four starters. Notes: Charles Thompson looks to be the leader of the returning defensive line. Bob McLaughlin should see lots of playing time. Every thing else seems up for grabs. Outside of QB, this has to be the major area of concern for 2010. Vladimir Ducasse is ranked #1 in Josh Buchanan's latest "Small Schools" NFL Draft List. Jeromy Miles and Chris Zardas also make the list. On the same site, Appalachian State's Armanti Edwards has started a Draft Journal. Matty Vautour reports the UMass AD John McCutcheon is a top candidate for the AD job at San Diego State. The UMass Football Blog would be sorry to see McCutcheon go. He has been a strong supporter of UMass football and has overseen the revival of McGuirk Stadium. Vladimir Ducasse will play in the Senior Bowl today at 4:00 pm EST. The game is on the NFL network. A commenter has made a number of posts, which I have moderated, saying UMass has a verbal from a FBS-level QB recruit. I'll run those---and apologize for moderating the comments--as soon as I can get some independent verification of the information. As everybody knows, the last few days are really hectic in FCS/I-AA recruiting circles. Players who have been holding out for I-A offers don't get the call and suddenly want to commit. Players that have been committed to UMass leave when they receive a last minute FBS offer. That's life in I-AA. UMass has received a verbal from Kirkland Nelms a 5-11 175 pd DB and kick returner from Fredricksburg, VA.
Press release on Nelms decision here. Nine minute YouTube highlight video here. He drew interest from Duke, Liberty, North Carolina and Richmond. UPDATE FRIDAY 01/29: MassLive Online has a article on the Gillette game here. 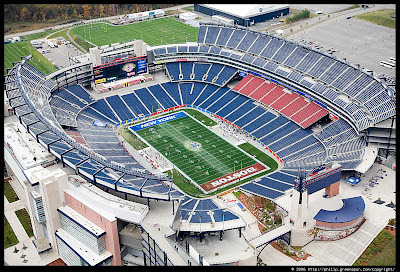 According to the Boston Globe, UMass and UNH will play at Gillette Stadium in 2010 and 2011! That converts a 2010 away game to a neutral field. This can be nothing but good as UMass is sure to bring the amazin' UMass Marching Band. Should make a good show for UMass football and the University. If Kraft is serious about college football at Gillette, maybe UMass could schedule a FBS opponent or maybe a headline FCS team like Montana. UMass is recruiting Dylan Swartz a 6-3 220 pd pro-style QB from Modesto CA. Image from Scout.com. The Modesto Bee has a video interview with him here. Swartz was Conference Offensive MVP. Drawing interest from a number of FBS/I-A teams including Arizona, Arizona State, Fresno State, Idaho, Nevada, San Diego, San Diego State,UCLA, Washington and Washington State. The CAA has released the 2009 All-Academic team and the Academic All-conference team. The UMass athletic dept also has a press release here. UMass will welcome Hofstra transfer Anthony Nelson who also made the list. MassLive.com reports that former UMass star and coach Joe Cullen has named defensive line coach of the Jacksonville Jaguars. FCS team Eastern Washington will install artificial turf-----in the team colors of red & white. the latest edition of David Coulson's "Around FCS" newsletter discusses FCS players in the various All-Star games. UMass is interested in E.J. Schneider a 6-0 190 pd QB from Morristown, NJ. Some highlights here. Schneider is #4. He was 2nd team All-State and All Morris County. One week until National Signing Day! UPDATE: As first reported by Matty Vautour, Mike Quinn verbals to Elon. Matty Vautour has an article on Antoine Tharpe's verbal commitment to UMass as well as some other UMass football news here. Don Brown signs a blitz specialist. Still lots of stories about Valadimir Ducasse being published. NJ.com has a good human interest one here. William & Mary's 2010 schedule is up. They have games with new FCS/I-AA team Old Dominion and North Carolina. First brought to my attention over at the Wizard of Odds Blog: NCAA rules for college football recruiting. The FCS Now blog has list of the 18 head coaching changes in FCS/I-AA this year. Baskerville is #8. Image by Dean College. Photographer not listed. UMass is interested in Anthony Baskerville a 5-11 180 pd Athlete from Dean College in MA. Baskerville did it all for the Bulldogs this year. Rushing he went 160-722 4.5 AVE 6 TDs 53 LONG 72 yards/game (rushing totals include 211 yards lost in QB role). Averaged 195 yards/game in all roles. This 2007 article from NJ.com features him. Also recruited by Rhode Island. As reported by a commenter yesterday, Antoine Tharpe a 5-11, 180 pd DB from Coral Springs FL has verbaled to UMass. I had blogged about Tharpe back on Oct 14th, 2009. The original blog post has his Rivals page, video highlights and more. Tharpe is the second verbal (that we know about) in UMass' 2010 class. Welcome to the Minutemen, Antoine! As reported by a commenter in yesterday's blog post Chris Zardas is on the roster of Texas Vs. The World All Star game. On Jan 21, I received an e-mail from the UMass On-line store that a number of UMass football items were on clearance prices. There were some nice stuff including UMass football t-shirts and a #28 replica jersey. However, when I go to the on-line store the articles are not in the "clearance" section and seem to be at regular prices. Not sure what's going on here, but football fans should keep an eye out for some bargains, if the original e-mail was correct. UNH will play at Toledo in 2011. UPDATE Friday evening: The UMass athletic dept now has a article on the football transfers. As reported by "Sign Man" here yesterday and today by Matty Vautour in this article about transfers to UMass, the Minutemen have added another two mid-year transfers to the football squad. Travis Poston a 6-6 320 pd OL will transfer from Villanova. I've blogged about Poston three times before when UMass was recruiting him. Since he is transferring laterally, he will have to sit out one year before being able to play. 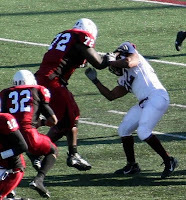 Galen Clemons a 6-2 255 pd DE from Central Michigan will also transfer to UMass. The Chippewas have already scrubbed his bio, but the recruiting notice is here. At Northampton High School: Four-year starter ... 2008 team captain ... all-conference first team selection as an offensive and defensive lineman in 2008 ... earned all-area first team honors from both the Express-Times and the Morning Call ... credited with 87 tackles in 2008 ... made 83 stops in 2007, 102 tackles in 2006 and 71 in 2005 ... helped lead team to 4A Eastern Conference championships in 2006 and 2008 ... Northampton finished 10-3 overall in 2008 ... two-year letterman in track and field. Personal: Son of Steve and Wendy Clemons ... born June 3, 1990 ... chose CMU over Akron and Army. Since he is transferring from a FBS/I-A team, Clemons will be eligible immediately. That brings UMass to a total of seven transfers and one verbal so far in the 2010 recruiting wars. Two more articles about Vladimir Ducasse and his efforts to help Haiti here and here. New Hampshire lands a NJ running back. Ron Chimelis has an article on the five transfers to UMass from Hofstra and Northeastern. Anthony Nelson- Top-20 all-time receptions for the Pride, Nominated for CAA Scholar Athlete. There were 19 seniors in the Media Day seniors photo. Probably not all of them were receiving scholarships. Assuming all five transfers get a ride, there should be 12 or so slots remaining for the rest of 2010 recruits. James Madison has announced its official 2010 schedule. The FCS discussion board "Any Given Saturday" is down again along with the related CSN website. The Boston Globe has a story on BC's Mike McLaughlin, son of UMass legend Mike Sr.
MassLive.com has a story on Vladimir Ducasse's family in Haiti and his efforts to help his nation. Matty Vautour has another story on Ducasse coping with the tragedy in his homeland. Bleacher Report says the Big East should grab UMass to fill the ( basketball) vacancy if Notre Dame should leave. It would be even better if UMass football made the leap also. That would end the cycle of funding problems every time there is a recession---which seems to happen every four years or so lately. Off topic question. What happened to Atlantic 10 TV basketball? Like most males I surf sports a lot. Last night I ended up watching Hofstra-George Mason (dropping football does not seem as if it has jump started any interest in Pride basketball, but I digress) ---- I never hit an Atlantic 10 game. Where did all the A10 basketball games go? Fordham's John Skelton has been impressing people at the Shrine game workouts. Mike McLaughlin gets mixed reviews. Two weeks to go till National Letter-of-Intent Day (a National Holiday for college football fans). I went through the stats for all eleven games in 2009 to check on offensive linemen. NOTES: The UMass offensive line led the CAA in sacks against with only 17-130 yards 1.55/game AVE. We had seven different players start, including four at RG. Senior math major Jarad Chivers came out of nowhere to start eleven games for the Minutemen. Before the season started, I thought the UMass running game would dominate. I felt we under achieved somewhat in the run aspect of the offense. We did have an injury to Tony Nelson. We also got behind early in a number of games and that forced a reduction in carries. The Minutemen ended up 5th in the CAA with 148.8 yards/game. In 2010, we lose two starters. Niland and Milhim would seem to be top two contenders--- except neither are centers. Samuda has played center before and that would allow Milhim to stay at RG. Ostaszewski has played some guard, so he could possibly move to LG if Samuda moved to center. That would free up LT for Niland. Vladimir Ducasse has been selected to the Senior Bowl. UMass athletic dept story here. Full roster for the Senior Bowl here. Former UMass star James Ihedigbo had another big day for the NY Jets yesterday. He forced a fumble on special teams and continues to make an impact when he plays. Former UMass star Brian Smith is the quality control coach for the Jets. If nothing else this Sunday, read this story by the New Haven Register about UMass' Vladimir Ducasse. 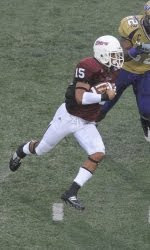 More from Matty Vautour about the 2010 UMass football schedule. Official 2010 Rhode Island schedule (pdf). Provisional 2010 Delaware schedule . If you had a rough years in 2008 and 2009 with your investments -----you're still doing better than Bernie Kosar. 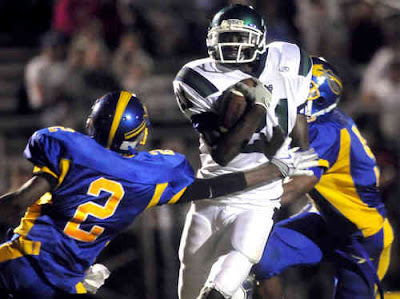 Scott Coen of MassLive.com says James Ihidigbo is having a great season for the Jets. Holy Cross QB Dominic Randolph has picked up an agent. Another NFL mock draft picks Ducasse a third round pick for the Oakland Raiders. Former UMass coach Jimmy Reid talks about his life in coaching. Rhode Island has posted its 2010 schedule. The 2010 UMass football schedule is up. Article from the UMass website here. Matty Vautour has commentary on the schedule here. Ron Chimelis has a story here. Pretty good schedule from a fan's point of view. Bill & Mary and Holy Cross are sure to be big draws as night games. Richmond and Delaware should be Top-15 teams in 2010. And Michigan is a "Bucket List" game for all college football fans. Mrs Blog and I are already looking at trips to the Big House as well as Towson and James Madison. The NCAA has mandated an eleven game schedule in 2010. As Matty Vautour notes, there is no paid home win this year. Stony Brook is an up-and-coming FCS program and presumably they wanted too much for a buyout to play at UMass. The Minutemen should be the headline attraction in their schedule. We'll be talking a lot more about the 2010 games as the year goes by. The Bleacher Report says Vladimir Ducasse would look good in the Raiders Black and silver. More on Neal Brown's hiring as OC for Texas Tech (mentions UMass). Cutting Northeastern football does not seem to be helping the rest of the Huskies' athletic programs. I would figure hockey would be one of the headline sports at Northeastern now that football is gone. I watched UMass hockey beat Northeastern 4-1 a short time ago. The game only drew an official crowd of 2,160, which seems generous given the noise level and empty seats visible during the broadcast. Matt Lawrence is still on the injured reserve list (scroll) at the Baltimore Ravens. By my count, I've done 38 2010 UMass recruiting posts. Blogger has the ability to list them with a search. Click here to access the search. When you reach the end of this page's stack, hit "older" and another page will display. It's official. Neal Brown is the new OC for the Texas Tech Red Raiders. Brown's hiring drew 120 comments on the Red Raider Blog "Double T Nation"
Matty Vautour mentions Brown and former UMass QB Liam Coen in his latest UMass news article. 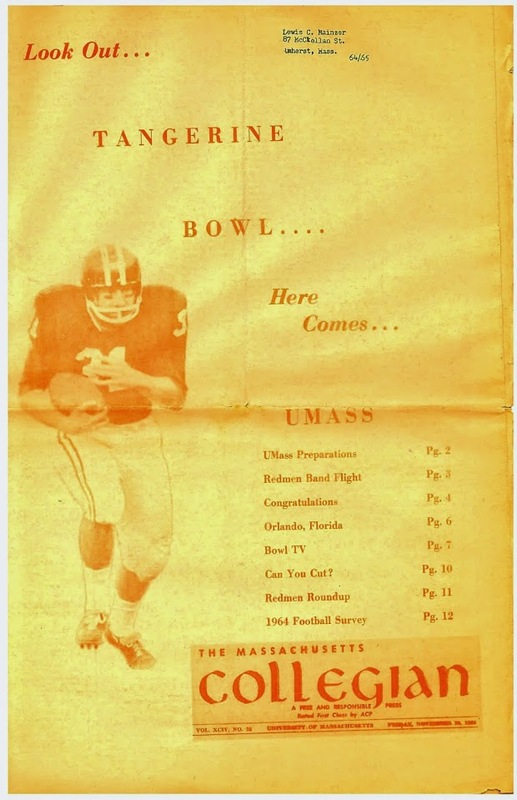 MassLive.com has a feature on Ed Struzzio a former UMass football player and Captain who graduated in 1949. Struzzio won four letters for Minutemen. He sounds like the kinda guy you'd want on your team. Go UMass! BTW, UConn is playing Michigan next year too. Villanova HC Andy Talley has won the FCS National Coach-of-the-Year Award for the second time. Football scoop reports that former UMass player and current Troy OC Neal Brown is being considered for the OC position at Texas Tech. I've blogged about Brown before. Brown appears to be one of the brightest young offensive minds in coaching. I've always hoped that he would do a head coaching tour at UMass. If he is appointed OC at the Red Raiders, he may bypass FCS football completely. UPDATE: It is confirmed that Texas Tech has contacted Brown. The New York Post mentions current Miami OC Mark Whipple in connection with the open HC position in South Florida. Sporting News has an article on five seniors who should have been invited to the NFL combine. Jeromy Miles is one of them. Former UMass QB Liam Coen is on the roster of the Alabama Vipers arena team. The Richmond Times-Dispatch says academics and athletics enticed UCS QB Aaron Corp to transfer to the Spiders. The CAA website has a master list of the 73 honors gathered by CAA football players in various All-America team. The New Hampshire Wildcats land a QB recruit from the Pittsburgh area. UMass is interested in Stanley Dunbar a 5-9 186 CB from Dean College in MA. His Rivals page is here. He runs a 4.48 40. Dunbar was All-State in 4 X 100 track. He was the 2008 Rhode Island Gatorade Player-of-the-year. Dunbar had 10 kickoff returns in 2009 for 143 yards and a 14.3 AVE. He started all ten games for the Bulldogs and had 21 UT 7 AT 28 TT 1-3 TFL 1 INT 12 BRKUP (tops on team) 1 FF. 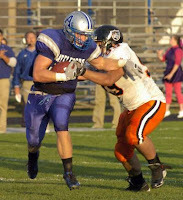 He was 2nd team All-League in 2009. Also being recruited by CAA North teams UNH and URI. Former UMass star James Ihedigbo got lots of playing time during yesterday's Jets win over the Bengals. He hurried Carson Palmer on at least one blitz. This article from the Sun Coast Times has some ink on Ravens coach and former UMass player Clarence Brooks. I've blogged about Brooks before. ESPN reports that Tommy Tuberville will be named the new HC at Texas Tech. 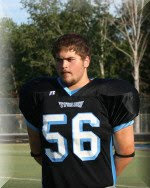 UMass is interested in Ellett McGeorge a 6-6 270 pd OL from Midlothian, VA.
His Rivals page is here. McGeorge runs a 5.23 40 (which is pretty good for an OL). Also drawing interest from Liberty, North Carolina, Old Dominion, Villanova and Richmond. Image from the HS website. Image of Tony by Associated Press. 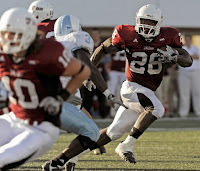 In 2008 UMass running backs went (in 12 games) 390-1,744 4.4 AVE 20 TD's 64 LONG 147.8 yards/game. UMass was 5th in the CAA in rushing and 44th nationally. Tony Nelson was 3rd and Jonathon Hernandez was 8th in the CAA. Those players had 44.3% of UMass' rushing total. Notes: UMass' running game felt worse than it was. Tony Nelson missed a number of CAA games due to injury. In addition, UMass fell behind quickly and had to abandon the run fairly early in some games. In three losses, UMass had 82 total yards against Maine, 62 against Richmond and 32 against Delaware. The addition of Griffin holds the promise that UMass could be a good running team in 2010. Hernandez ran well in spots. He needs to reduce turnovers. Smith and Unterkoefler could also be factors after red shirting last year. As reported here earlier, The Boston Herald says former UMass HC Jimmy Reid has been hired as Defensive Coordinator at UVA. MassLive.com probably has the most detailed story about Reid's hiring here. Several UMass coaches including HC Kevin Morris will be celebrity waiters for 2nd annual Amherst Survival Center's "Empty Bowls" Dinner next week. The Richmond Spiders added USC backup QB Aaron Corp who transferred to Richmond this week. In 2008, seven FBS schools played two FCS opponents. The remaining CAA North teams are recovering from the shock of losing Hofstra and Northeastern. The recession continues to hit college football websites. FootballCoachScoop.com is down for lack of funds. Conspiracy theorists are having a field day at Texas Tech. Appalachian State's Armanti Edwards has received an invitation to participate in the 2010 NFL Combine. Two Western Mass players were named to the 2009 "All-State Super 26 Team"
The complete roster of the Massachusetts High School Football Coaches Association "Super 26 Team" here. UMass is interested in Alec Vozenilek a 5-10 175 pd kicker from Richmond, VA.
His Rival's page is here. YouTube recruiting video here. Virginia All-State honorable mention. This article from the Times-Dispatch says UMass is among the leaders in a whole bunch of CAA schools interested in Vozenilek. Former UMass star James Ihedigbo was hurt in the Jets practice on the 5th, but it looks like he's OK (click on latest news, I can't seem to point at the latest update). It seems Ihedigbo just had a stinger and later participated in the full practice. Any Given Saturday is back up. UMass had offered to Jordan Rogers a 6-2 210 pd JUCO Pro-style QB from Bute C.C. (California). He verbaled to Vanderbilt. Image of returning WR Julian Talley is by the UMass Athletic Dept. In NCAA stats, UMass was 27th nationally in 2009. That's a total of 102 catches and 1235 yards. Those receivers accounted for 48% of UMass' receiving yards. Notes: The TE position look solid for 2010. Emil Igwenaqu as an "H" back was third in the team in catches and looked athletic while doing so. Andrew Kervis had two of the teams 11 pasing TD's despite not being thrown to much. The WR position looks more problematic. Julian Talley should start. After him, things look thin. Syracuse transfer Dan Sheeran was originally rated as a pretty good recruit for the Orange. He would seem to have the inside track to be the other wideout in 2010. JUCO receiver Jesse Julmiste was a late addition to the 2009 UMass squad. He was All-Broward County in 2006 (link is pdf). His Rivals page is here. In his senior year he drew interest from UCF, Memphis, Rutgers and Temple. His highlight tape claims he ran a 4.32 40 in HS. It remains to be seen if Julmiste is a Adrian Zullo type WR or is destined to run back kickoffs. Receivers is a position that could use some recruiting attention in 2010. Beyond Tally and Sheeran there does not seem to be a lot of Division I talent. Besides any freshman recruits, a JUCO or I-A transfer would be a prudent get. In last Friday's blog post I mentioned the Blog's sister was attending the Tournament of Roses and the Rose Bowl. 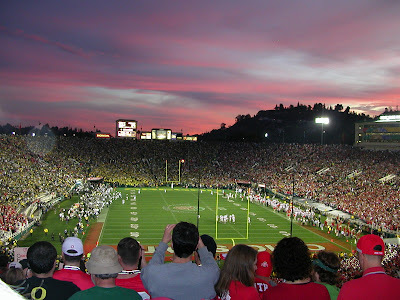 Attached is an image she took of the Rose Bowl. Click on the image and Blogger displays a much larger view. This source says that former UMass HC Jimmy Reid will be hired as the Defensive Coordinator for the Virginia Cavaliers. CSN's news site is back up. Former UMass star James Ihedigbo had a sack and a FF during last night's frigid Jet-Bengals game. Image by Andrew Mills Star-Ledger. Good Morning from Jaffrey, NH, or as we locals like to refer to it as "Ice Station Zebra". "Col. Hogan" has been pestering me to join Championshipsubdivision.com. I did join yesterday and found that they had a future schedules page. This should be taken with a grain of salt as it's fan generated, but FWIW, it lists three dates for the 2010 UMass schedule. College Sports News says they will be back up shortly. "Coaching College Football. That's where a bunch of 19-year-olds run around with your paycheck in their pocket"--- former UMass Coach Jimmy Reid to the Blog in a conversation a number of years ago. Two ECU player get suspended from the Liberty Bowl by getting into a fight at the bowl awards banquet---over a desert. UConn is 3-1 in bowl games since they moved to FBS/I-A football in 2002. The Huskies beat South Carolina 20-7 in the PapaJohn's Bowl. The Bleacher report says the Big East Football should expand to 12 teams and add an up-and-coming football program such as Villanova. 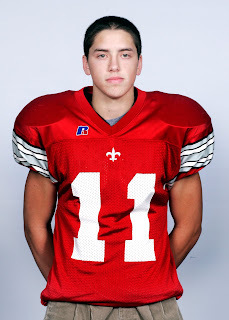 According to the Sun-Chronicle UMass has its first verbal of 2010 from Matt Campbell of Attleboro, MA. Campbell is a member of the Massachusetts "Super 26" All-Star Team. He's a 6-1 210 pd FB/LB. I've blogged about Campbell back on October 1st. He has a lot more mentions here. Image by (I believe) Sun-Chronicle. Matty Vautour makes his list of the Top-25 UMass athletes of the decade. Includes Shannon James, Liam Coen and Steve Baylark. Matty Vautour also looks at the future of UMass athletics. He notes that demise of Northeastern and Hofstra have some implications for the Minutemen. Not to raise the pressure on the coaching staff, but this comment from Matty mirrors my feelings exactly:"In the meantime, it would behoove the Minutemen to get back on the positive side of .500. A few losing seasons in a row wouldn't help attendance and interest and if those fade, they'd be in much tougher shape the next time the economy goes south." In a surprise move, Montana moves their current WR coach Robin Pflugrad to head coach of the Grizzlies. More from the Montana website. In addition, the Montana-Appalachian State playoff game drew the best ever FCS playoff TV ratings and the Villlanova-Montana National Championship Game drew the best TV ratings in eleven years. Story here. A UConn Blogger discusses the rise of Husky Football. The "Any Given Saturday" and the College Sporting News website continue to be down since December 30th. Those two sites were a big part the the FCS online culture. I hope they can return soon.